Starting with a definition, what is an Enterprise Project Type (EPT)? 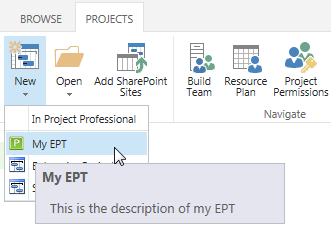 In Microsoft Project Web App, an enterprise project type (EPT) represents a wrapper that encapsulates phases, stages, a single workflow, and Project Detail Pages (PDPs). Each EPT represents a single project type. From bottom to top, to create an EPT, you first need to create Enterprise Custom Fields, Project detail pages (that might contains custom web-parts), workflow (with phases that contain stages) and finally the EPT. 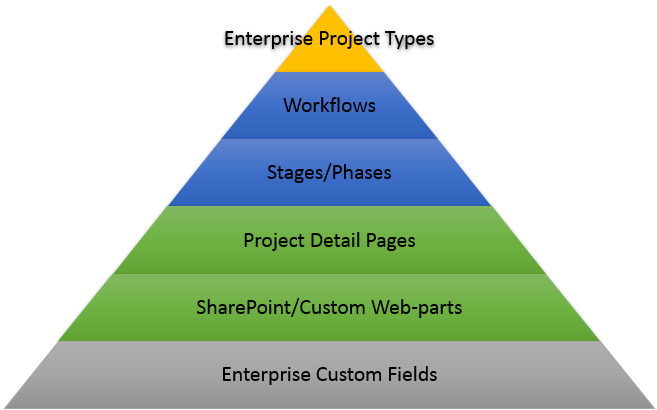 Still quoting Microsoft’s definition of EPT, normally, project types are aligned with individual departments: for example, marketing projects, IT projects, or HR projects. Using project types helps categorize projects within the same organization that have a similar project life cycle. In my current company, our project management methodology is adaptive to each project, depending on project complexity, department or programs of the project. This is why we have created several EPT’s. As described above, the first step consists in creating necessary Enterprise Custom Fields and Lookup Tables. Note that this might be optional if all necessary fields already exist. 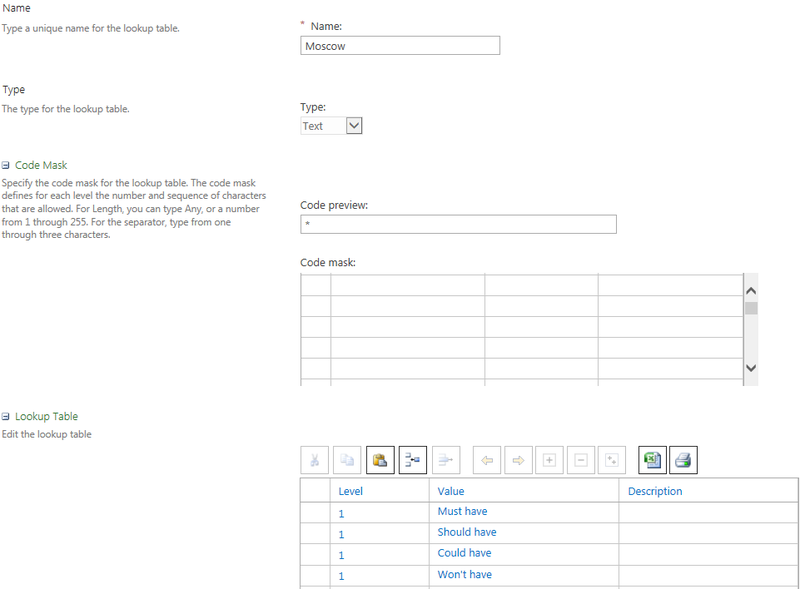 Enterprise Custom Fields and Lookup Tables link is classified under Enterprise Data. Priority (MoSCoW), this will be a lookup fields based on the well know MoSCoW prioritization technique (more info on Wikipedia). Now for the creation of the custom field itself, go back to the Enterprise Custom Fields and Lookup Tables page and click on NEW FIELD. 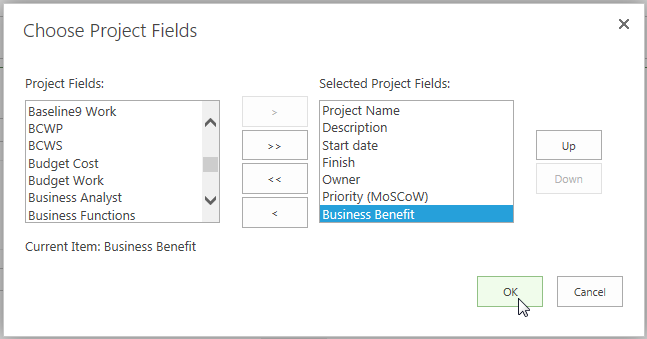 Create a field called Priority (MoSCoW), link this to a Project entity (as this is a project property, opposition to task or resource properties), type is Text, and on Custom attributes, select Lookup. Choose the Moscow lookup table. You might check remaining properties which I think are self-explanatory (e.g. “Allow multiple values to be selected from lookup table”). Second field to be created: Business benefit. 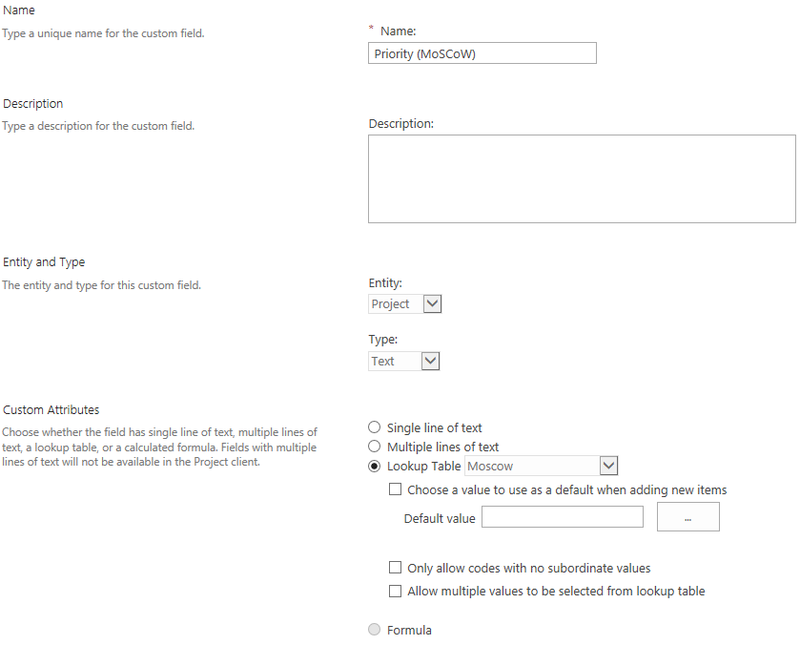 Same as before, back to the Enterprise Custom Fields and Lookup Tables page, click on NEW FIELD. This field is also a Project entity and the type is Text. Custom attributes is set to Multiple lines of text. Now, our next job consists in creating the Project detail pages (PDP). PDP’s might contain custom web-parts. To limit the complexity of this article, I will just edit the out of the box [Project Details] PDP, and add the two fields we just created. The PDP library is a standard SharePoint page library, hence you can Create new page, download a copy and upload a page modified or created with another application. Click on the [Project Details] page to edit it. On the ribbon, click on the PAGE tab and click on Edit Page. 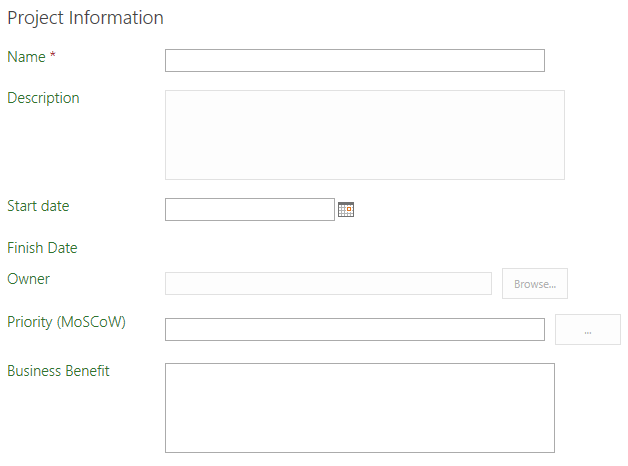 We will add the two fields on the Project Information web-part. Select the web-part (checkbox on the top right corner of the web-part. Click on the WEB PART tab and click on Web Part Properties. Those who are already familiar with SharePoint web-parts will find it easy. Just to emphasis on two of the web-part properties, Title is what is displayed on the page on top of the web-part and Display Project Fields will give us the opportunity to select which custom fields we will display. This is where we will had our two fields. Click on Modify under the fields list. Click on OK to save your selection. The Choose Project fields pop up closes. Back to the web-part properties, click on Apply to save your change. On the ribbon, PAGE tab, click on Stop editing. At this stage, we can create a workflow if requested. The workflow creation will be explained in another blog post, hence I will not create one for this example. We are now ready to create our Enterprise Project Type. On the PWA settings page, click on Enterprise Project Types, under Workflow and Project Detail Pages. Click on NEW ENTERPRISE PROJECT TYPE. Name it “My EPT” and add a description. 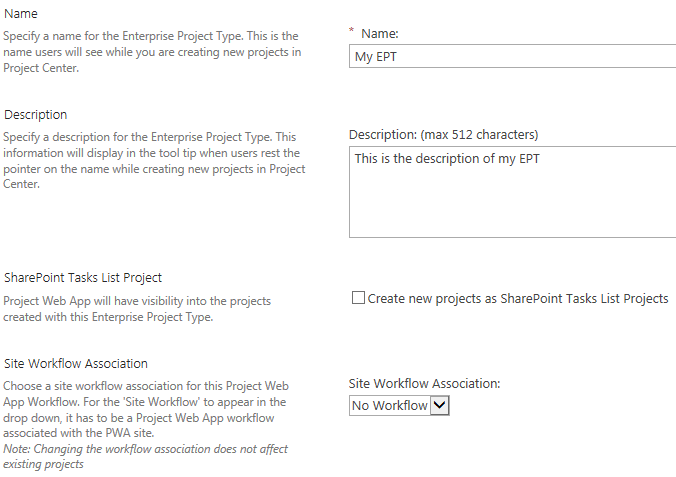 We don’t’ want this project type to be a SharePoint list (list of tasks in a SharePoint list, opposed to the Microsoft Project plan) and there is no workflow associated. The new project page will be the [Project Details] page, and [Project Details] and [Schedule] pages are the two pages available. Other fields are also self-explanatory (e.g. position on the template list, select an icon to display…). Project Plan Template (which is the template of your Microsoft Project plan) and Project Site Template (which is the SharePoint site that will be provisioned to manage project’s documents and lists) will be detailed in another blog post. Save and voila, the project type is created. Create a new project based on the EPT. Go on the Project Center page (http://myurl/PWA/Projects.aspx), click on the PROJECTS ribbon’s tab, and click on the arrow under New. Select My EPT to create your project.